Tanger Outlets in Southhaven, MS recently partnered with Burton Signworks, Inc (BSI) to design and build a large freeway sign featuring a 20' x 40' dynamic high resolution full color LED display. Tanger Outlets in Southhaven, MS now features a brand new spectacular sign wielding a brilliant high resolution full color LED display that will catch the attention thousands of cars passing by their highway location. SOUTHHAVEN, MS--(Marketwired - February 25, 2016) - Tanger Outlets is committed to bringing you the "ultimate shopping experience" by offering the leading name brands, and now, they bring you the ultimate viewing experience. After partnering with Burton Signworks (BSI) in North Carolina, Tanger Outlets in Southhaven, MS now features a brand new spectacular sign wielding a brilliant high resolution full color LED display. The power of this 20 x 40' digital sign will catch the attention thousands of cars passing by their highway location. Jeff Smith of BSI stated, "Tanger wanted to improve their visibility from the highway for their various tenants, and I believe we accomplished their vision...and more. The sign turned out great, and the large digital display is simply amazing to look at." BSI is a custom sign manufacturer that prides itself on quality & performance. For the digital portion of this job, they turned to innovative LED display manufacturer, Vantage LED, located in Ontario, CA who provided their 20mm Full Color Phoenix FLEX Series. Smith continued, "Vantage has been a true partner in every project we have worked on that involves LED message centers. The knowledge of the sales reps is second to none! The support from corporate with cross-marketing pieces to diagnosis and troubleshooting is perfect!" 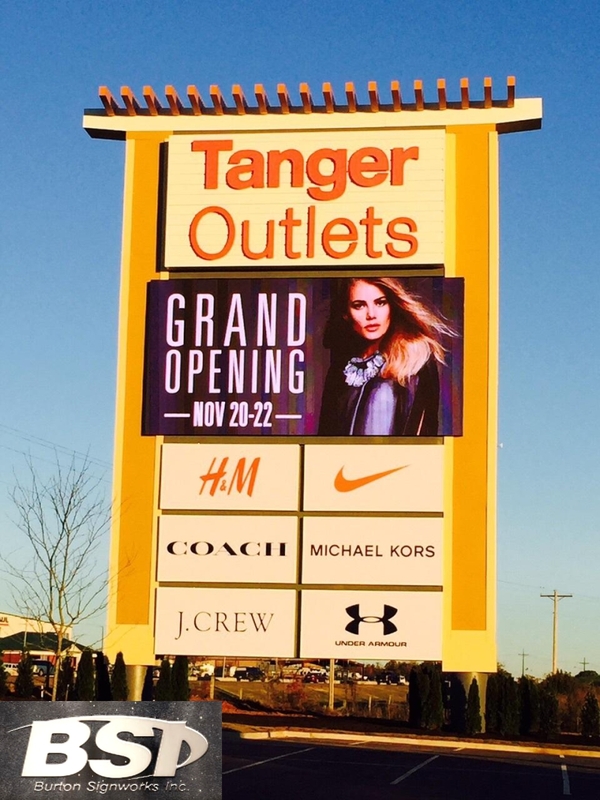 Kyla Godden, Regional Sales for Vantage LED, stated, "I am very excited that we were able to work so closely between Burton Signworks and Tanger Outlets to develop one of the most stunning LED Displays in the Southeast." 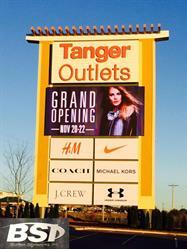 Tanger Outlets is always known to offer popular brands from many different high-end fashion designers, and they believe this new spectacular sign will bring even more excitement for shoppers driving in. All the amazing fashions and ongoing sales being advertised on this brilliant LED sign will sure to bring in many impulse sales. Burton Signworks Inc. started as Burton Electric Signs 30+ years ago. They are a full service sign manufacturer and installation company strategically located in Northwest North Carolina. Their attention to detail and unmatched quality coupled with a dynamic project management team is what sets them apart from the competition. The dedication to their customers is what makes the difference in today's very challenging business environment.